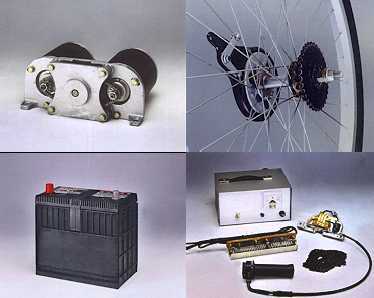 e-conversion kit prices These kits include the hub motor, voltage and speed controllers, brake levers with automatic shuff-off switches...though do not include batteries, charger, or rack mounts. 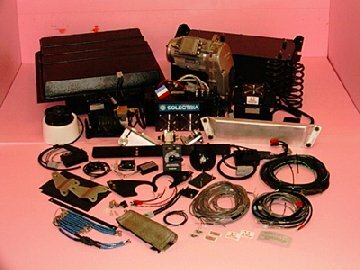 At this time they are $600 per kit to cover air freight and customs broker fees, plus shipping within the U.S. Expect your order to cost approximately $750, including batteries and charger--for Spring 2002 delivery. Range: More than 1 hour running time for 160 lbs rider. Motor Size: 7 1/2" dia., 3" wide, 6" L x 7/16" dia. shaft. Wt. 5.4kg. Front hub dimension can mount in any normal fork, rear hub motor with threads to accommodate 6 sprockets..
Evercel battery option available soon for lighter weight...longer lasting power! The dual motor bicycle and single rear wheel tricycle kits now available only on an advanced order basis. 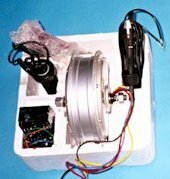 Intended to power demanding cycle applications (tricycle freight, bicycles on steeper inclines, pedicabs, two and four passenger cycles...), this dual motor system can be wired to switch between parallel and series for added power. The motor lay-out allows for a lower profile than a bulkier single, one horse power motor design. The kit price does not include battery. The new Evercel NiZn type will soon make these kits lighter and more functional...for those who prefer a motor that ties into the pedal gearing. Remember Evercel nickel-zinc battery pack options are 2/3 the weight of lead acid and could provide twice the driving distance depending on total vehicle weight.